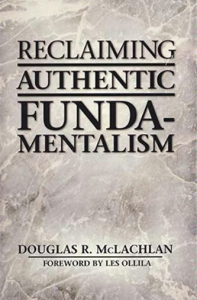 It was refreshing and stimulating to read a book on Fundamentalism by a fundamentalist whom we all know well. We don’t seem to mind the pointed corrections when they come from one of us. McLachlan does a good job of putting his finger on the problems of a powerless ministry and outlining biblical solutions which we have all seen and of which we need to be reminded. Without detracting at all from the profit this book should bring, my personal hope is that soon fundamentalism can move beyond the present introspective stage. I know it is a necessity and I have spent time on it myself. Perhaps the nineties is the decade of self-examination for Fundamentalism but Fundamentalism needs to do it, not just write about it. Our churches need to hear us promote a positive, biblical Fundamentalism with Godly examples and spiritual ministries. I’ve tried to make it a personal policy not to use preachers and others ministers as bad examples in front of my people. It’s no wonder they hesitate in supporting even the good causes of Fundamentalism. Perhaps this book will be a stepping stone to the next decade.